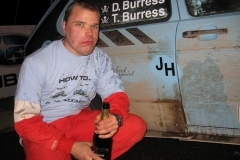 The Olympus Rally proved to be the last rally for the DemonRally Rabbit/Shark. 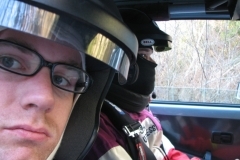 It was known since we first got in the car that we would join the ranks of rallyists that have rolled their car. We're not content to cruise around the stages, we're out to win! We'll be back soon with an even better car. 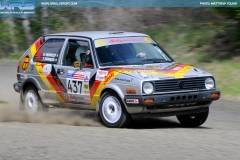 The Demon Rally Team debuts their new rally car in Pomeroy Washington in their typical class winning ways. 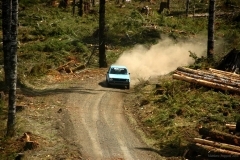 A view of the Doo Wop Rally from the view of the co-driver. We were close to winning this one overall when the fuel pump gave up. 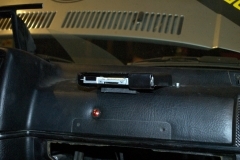 And the replacement leaked. The backup replacement worked, so we missed only one stage, but it's enough to DNF for the series. In the cold Upper Peninsula of Michigan, we persevered and represented the Northwest in style. We also won Gp2 and finished 16th overall, tried out stage notes for the first time, and, most importantly, earned a 4th in the Max-Attack! competition. 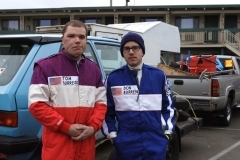 Our first rally was Doo Wops 2006. We didn't even have a car number, but we finished and did well enough to win the novice trophy. An excellent start to our rally career. 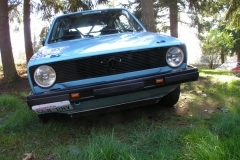 Our first outing at the Oregon Trail rally and our second stage rally ever. It turned out pretty unsuccessfully as the car was going through teething problems and we were learning what it could take the hard way. However the team persevered and set some fast stage times on day 3. 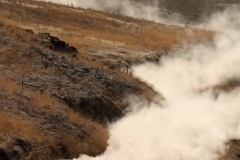 A great fight from the DemonRally team was cut a bit short by a flat tire on the Pico stage. We did our best to make up the time, but couldn't overcome the approximately 1 minute loss to claim a Gp2 win on Day 2. 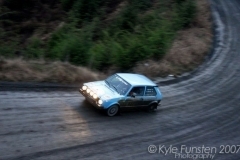 This rally established us as a official contender in the local rally scene. Oregon Trail was our first experience with the Max-Attack! series. Though we didn't place due to multiple mechanical difficulties, we charged as hard as we could and finished our first national rally! We didn't have an official photographer, so we gathered these photos from the internet. Please visit the websites of the photographer, if available, to see more of their hard work. 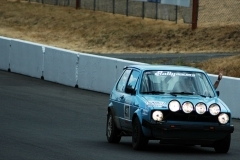 The Demon Rally Team shows off their turbocharged Volkswagen Golf Rally Car at the Northwest\'s biggest European car show. The last Waterwagens that we were able to attend was rainy, but still well populated. We tried some drag racing and spent significant time in our sponsor's display of cars. 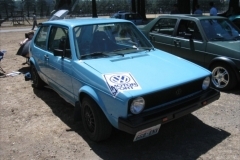 Fine Tuning was well represented by a cadre of VW's, Audi's and BMW's and ranged from glamorous show car to purpose-built rally car. Despite the rain, it was a great show. The great annual DCI BBQ is a select group of VW enthusiasts getting together and having a good time. 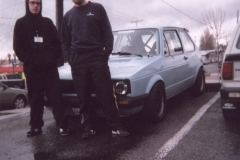 Dubsquad Conglomerate International is a VW car club that we were involved in for a few years. Their annual BBQ is an event not to miss. 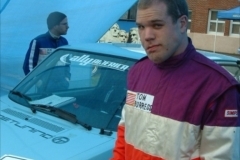 Our first outing with the rally car. Before we had done any events we took it to Waterwagens to get some exposure for the upcoming build and racing. 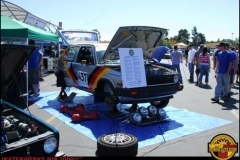 Our second year at the Waterwagens VW show at Pacific Raceways in Kent, Washington. 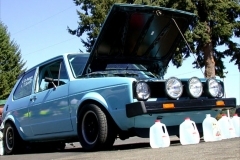 It's the largest VW enthusiast show in the northwest and great exposure for our sponsors. Promo shots and technical images of the new car. 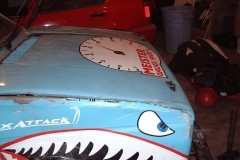 Here are some of the more technical pictures starting from when we purchased the shell to just before it was sent to the scrapper. The No Alibi TSD is a great rally to run if you are looking to get into stage rallies later in your career. 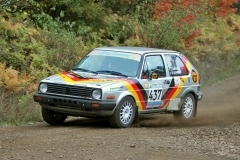 Run by the Rainier Auto Sports Club, it is a great introduction to rally timing and to gravel driving. The best TSD we participated in, though we only finished 5th in our class and 18th overall. 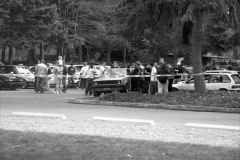 A TSD rally in Skagit County on back roads. Fun for learning rally timing and as an adventure!